Mr. Moto was conceived out of the popularity Charlie Chan. Though Charlie Chan is of Chinese-descent and Mr. Moto was Japanese, both fit into the category often described as "oriental-sleuth." In this type of show, the detectives were of Asian descent and spoke with a foreign accents regardless of the nationality of the performer. Like all detective-mystery old time radio shows, in each show the protagonist single-handedly discovered the origin of the crime thus saving the day. 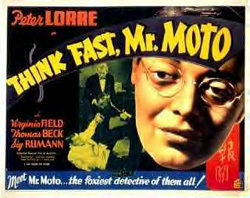 In the nine film series of Mr. Moto, Peter Lorre played the lead role. These films, though popular in the 1930s were no longer made once the United States entered WWII due to anti-Japanese sentiment. 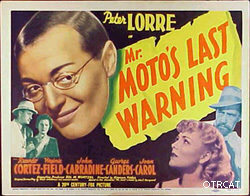 The radio show adaptations of Mr. Moto films were curiously made after the Second World War during the early 1950s. See also: Charlie Chan and Frank Wantanabe and the Honorable Archie. For more rare crime shows, see also: Rare Detective and Crime Shows Collection, Rarities: Adventure & Detective, and Dame Detectives, Female Crimefighters. Be the first to comment on "Mr Moto"